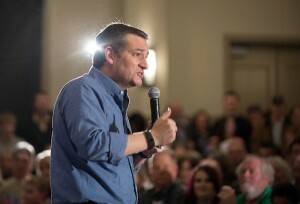 U.S. Sen. Ted Cruz fired up a crowd of evangelicals in West Des Moines, Iowa, on Jan. 27, 2016, ahead of the state’s Feb. 1 Republican presidential caucus, which Cruz won. For nearly all of the 2016 Republican presidential campaign, you would have been hard-pressed to hear Ted Cruz mention fellow competitor John Kasich. But now it’s a three-person race. And as Cruz tries to consolidate support from Republicans opposed to Donald Trump, the Texas senator is taking direct aim at Kasich, saying the Ohio governor is sabotaging the GOP’s hopes of defeating the billionaire. As Cruz’s complaints about Kasich reached a new volume, the Ohio governor’s campaign fired back Saturday, saying that it was the Texas senator who was playing spoiler. With Arizona and Utah holding their contests on Tuesday, Cruz is far ahead of Kasich in the delegate race, though both trail Trump. Kasich’s campaign is preparing for a contested convention in July and believes the Ohio governor could prevail there as a consensus choice. Cruz’s campaign is also getting ready for a contested convention but still holding out hope that he can defeat Trump at the ballot box and win 1,237 delegates before the billionaire can. The clash between Cruz and Kasich over each candidate’s viability has already put them in conflict more so than at any previous point in the race. Aside from some sparring over bank bailouts during a debate in November, Cruz and Kasich have hardly interacted throughout the nominating process, let alone in a negative light. Yet even as he steps up his criticism of Kasich’s nomination chances, Cruz has avoided going after Kasich in other ways — perhaps most conspicuously over Kasich’s decision to expand Medicaid in Ohio, a move that put him at odds with many fellow Republican governors. Asked Saturday in Utah if he thought Kasich was a conservative, Cruz told reporters he will let voters decide that. Cruz’s campaign hinted at one contrast Saturday with Kasich: the Ohio governor’s openness toward Merrick Garland, the D.C. circuit court judge whom President Barack Obama has nominated to replace the late justice Antonin Scalia on the U.S. Supreme Court. Many Republicans, including Cruz, have expressed adamant opposition to any nomination by Obama, arguing the choice should be up to the next president. In Utah, Kasich’s presence could be particularly problematic for Cruz, who is hoping to capture a majority of the vote, the threshold to win all of the state’s 40 delegates. Cruz suggested Friday that Kasich could keep him from winning more than 50 percent of the vote, creating a scenario in which the delegates are likely awarded on a proportional basis to all three candidates. “Right now Kasich on the ballot is just dividing votes in the opposition to Donald Trump, and if Kasich manages to pull enough votes in Utah to pull me below 50 percent, the effect of John Kasich will be giving Donald Trump 20 more delegates, which I think I would be a big, big mistake,” Cruz said in an interview on Utah radio. As Cruz campaigned Saturday in Utah, his supporters alluded to the need for a resounding victory Tuesday that could deny Trump a single delegate. Later in the rally, Cruz did not let Kasich go unmentioned as he reminded attendees that Mitt Romney, the 2012 Republican presidential nominee, announced a day earlier that he would vote for the Texas senator in the Utah caucuses. Romney stumped for Kasich in Ohio ahead of his victory there Tuesday. Katie Zezima of The Washington Post contributed reporting.